All semi-finals between 1871 and 1881 were played at Kennington Oval. The first neutral semi-final match outside London took place in 1882 in Huddersfield. The 1989 semi-final between Liverpool and Nottingham Forest at Hillsborough, Sheffield, turned into tragedy when 96 supporters were killed in the stands due to overcrowding. The Hillsborough disaster had wide-ranging effects on future stadium design. Liverpool were granted a special dispensation to avoid playing their 2012 semi-final match against Everton on the 23rd anniversary of the disaster. In 2003, it was announced that all future semi-finals would be played at the new Wembley Stadium, once it had opened; this took effect in 2008. The decision was mainly for financial reasons, to allow the FA to recoup some of the costs of rebuilding the stadium. However, the move was opposed by traditionalists and drew criticism from some supporters' groups. Over a decade after the move, Aston Villa (amongst others) have called for the semi-finals to be regionalised once again. Tottenham Hotspur's 2018 semi-final was to some extent a home match for them, as they played their home games at Wembley that season while their new stadium was under construction. However for the semi-final the FA did not treat them as a home team. There were no semi-finals played in the 1872–73 competition. Under the rules at the time, holders Wanderers received a bye to the final. Queen's Park again decided not to contest a semi-final, so Oxford University advanced automatically. In 1991 the FA decided that only one replay should be played (starting with the 1991–92 competition). If this game ended in a draw, extra time would be played, followed by penalty kicks if the match was still even. In 1999 it was decided that the semi-finals should be decided in one game, with extra time and penalties if the score was level after 90 minutes. Replays are still used in earlier rounds, however, though they were eliminated in the quarter-finals in 2016. The last FA Cup semi-final replay, in 1999, saw Manchester United take on Arsenal at Villa Park. This turned out to become one of the most memorable semi-finals of all time, with Peter Schmeichel saving a last-minute penalty from Dennis Bergkamp and a Ryan Giggs extra time goal deciding the outcome in Manchester United's favour. In 2003 this goal was voted the greatest ever in FA Cup history. From 2016 to 2017, a fourth substitute was allowed in semi-final matches if the game went into extra time. Villa Park is the most used stadium in FA Cup semi–final history, having hosted 55 semi–finals. The highest attendance for an FA Cup semi-final is 88,141 for Everton's penalty win over Manchester United on 19 April 2009. It was the fourth semi-final to be played at the new Wembley Stadium. ^ Queen's Park could not afford a second trip to London for their semi-final replay and were forced to withdraw. 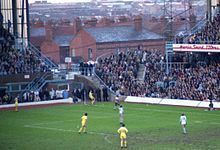 ^ Queen's Park once again withdrew from the FA Cup at the semi-final stage. ^ Match abandoned at half time due to a crush in the crowd and dark conditions. ^ Abandoned after 6 minutes (see Hillsborough Disaster). ^ "New Wembley to host semis". BBC News. 3 January 2003. Retrieved 25 February 2011. ^ "Football Supporters Hail FA Cup Semi-final Decision" (Press release). Football Supporters Federation. 18 November 2005. Archived from the original on 8 February 2007. Retrieved 25 February 2011. ^ "Moyes unhappy with Wembley semi". BBC News. 9 March 2009. Retrieved 25 February 2011. ^ Hughes, Rob (6 April 2008). "Nwanko Kanu repays Harry Redknapp's faith in one moment". London: TimesOnline. Retrieved 10 May 2008. This page was last edited on 14 April 2019, at 15:23 (UTC).